It's estimated that almost 3 million Jews living in Poland were killed by the Germans during World War II. But that wasn't the end of their ordeal. After the war, the murders of Jews continued, committed not by Germans, but by Polish nationalists who shot, stoned and beat them to death. In Marek Jan Chodakiewicz's view, this killing of Jewish survivors returning to their homeland probably wasn't anti-Semitism. In his opinion, many Jews did things, such as collaborating with Soviet Communists who occupied eastern Poland at the start of the war, that provoked the violence. Chodakiewicz argues that Jews were more likely to kill Poles after World War II than vice versa. These are not views shared widely outside of Chodakiewicz's native Poland, where much anger has been generated in recent years over scholarly dissections of Christian anti-Semitism. Many historians see these opinions as a minimizing of the Holocaust and, in particular, the violent anti-Semitism of many Polish Catholics. Chodakiewicz (pronounced hod-a-KAY-vich) is no obscure ideologue writing on an Internet hate site, but a history professor and member of the oversight board of the U.S. Holocaust Memorial Museum in Washington, D.C., appointed by President George W. Bush in 2005. The museum has been visited by more than 28 million people since it opened in 1993. In June, long-time neo-Nazi James von Brunn shot and killed security guard Stephen T. Johns at the museum's entrance. Chodakiewicz, a naturalized U.S. citizen, is a prominent voice in his native Poland. He is an ardent defender of his homeland who has repeatedly maintained that scholarly and other accounts of his countrymen killing Jews in anti-Semitic pogroms or massacres during and after the war are exaggerated or untrue. Sure, Jews were killed by Polish Christians, he says, but not usually out of ethnic hatred. The Jews were communists. The killers were bandits. Or they acted in self-defense or for other reasons. Much of what Chodakiewicz has written and said about the treatment of Jews by Poles has appeared in far-right Polish publications and has escaped notice in the United States. His term on the museum board is coming to an end in January, but his tenure at the highly regarded institution will be a feather in his academic cap for years to come. Chodakiewicz, who describes himself as "a Christian conservative of Polish ancestry," has written favorably about Francisco Franco, the late anti-Communist dictator known for his brutal suppression of the Spanish left. He is an admirer of the late shah of Iran, Reza Pahlavi, an autocratic leader who criticized American Jews for "controlling" U.S. media and finance. He sees gay rights as a threat to society, has linked President Barack Obama to communists and domestic terrorists, and is a voluble critic of what he sees as Western "political correctness." But it is Poles' killing of Jews during and after the war, and Poland's image as a result, that commands much of Chodakiewicz's attention. "You have to remember that in the West, the Holocaust is considered the worst crime in the modern history of the world," Chodakiewicz wrote this June in a conservative Polish newspaper, Rzeczpospolita (The Republic). Therefore, the accusation that Christian Polish peasants killed Jews "puts contemporary Poland in a terrible spot." Research on Polish-Jewish relations was left to post-communist historians and scholars who carelessly repeat theses heard in the West, Chodakiewicz complained. "In the best-case scenario, they dare to softly argue with the extreme Western opinions." What's needed, he maintained, are more historians with the guts to buck what he claims is political correctness that stifles open discourse. "Many historians don't know a lot about the Polish-Jewish relations," he wrote. "Some others prefer to be silent in order not to be in any trouble, not to create any controversies or — God forbid! — accusations of anti-Semitism." Some of Chodakiewicz's fellow historians contend that his views make him a terrible and inexplicable choice to serve on the museum board, known formally as the U.S. Holocaust Memorial Museum Council. And some do accuse him of anti-Semitism or, at the least, a dislike of Jews. "The guy is an ideologist of the radical right," says Jan T. Gross, a Princeton University history professor and the Polish-born author of two acclaimed books about the Poles' murder of Jews during and after World War II — books that sparked a political firestorm in Poland because they suggested a high level of Catholic anti-Semitism. "I don't have any doubts that he's anti-Semitic." University of Toronto Polish history professor Piotr Wróbel is less blunt. Chodakiewicz, he says, "has spent almost 30 years in the states — he would never use a phrase or adjective that would clearly identify him as an anti-Semite." But, he adds, "There is no doubt whatsoever that he doesn't like the Jews." Chodakiewicz flatly denies these criticisms. The allegation that he is an anti-Semite is "baseless," Chodakiewicz adds in an E-mail interview. "Through empirical research I strengthen the truth about the horror of the Jewish extermination. Further, I propagate knowledge of the Holocaust here and in Poland. I teach a seminar on 'Genocide and Genocide Prevention' and the work of the [Holocaust Museum] is very helpful, if not indispensable, for me. I agreed to serve on the Council because I believed that it was important to have a Christian conservative of Polish ancestry on its board." In fact, Chodakiewicz says, he's working in a key area of scholarship. "There have not been enough studies on the Christian predicament — indeed Christian suffering and death on a mass scale — during the contemporaneous period. To research, analyze and raise consciousness about such things is not to denigrate the suffering and genocide of the Jews." It's estimated that at least 2 million non-Jewish Poles, nearly all of them Catholics, were killed under the Nazi occupation. The Nazis' plan for Poland, according to the Holocaust Museum website, was to reduce the population to a huge labor pool serving the German master race. Gross, however, says that Chodakiewicz's membership on the board, which has 68 members (55 of them presidential appointees) and approves the museum's annual budget, is "scandalous." Other historians felt the same way when he was appointed, but thought it fruitless to make an issue of, he adds. "Surprised? I was shocked," says Wróbel, who was born and raised in Poland. A museum spokesman, Andrew Hollinger, declined to say if officials received complaints about Chodakiewicz's appointment. Chodakiewicz counters that he was appointed after a review by a selection committee, "who, after a thorough review of my academic accomplishments, considered me to be qualified for the position." Presidential appointees such as Chodakiewicz are vetted by the White House, not the museum. "The museum has no say," says Deborah Lipstadt, a professor of Modern Jewish and Holocaust Studies at Emory University in Atlanta who was famously sued by Holocaust denier and Third Reich "historian" David Irving for allegedly ruining his reputation in a 1994 book. (Lipstadt prevailed in that 2000 libel case.) Lipstadt should know: She was appointed by President Bill Clinton to two terms on the museum board. Marek Chodakiewicz, 47, was born in Warsaw but moved to the United States in 1982 and became a U.S. citizen. He earned master's and doctoral degrees from Columbia University and taught two years at the University of Virginia. Today, he is academic dean and a history professor at the Institute of World Politics, a boutique graduate school for future and current diplomats, intelligence officers and defense specialists. Its faculty has a "center-right to neo-con or very hard-core conservative" bent, says Gordon Adams, professor of international relations at American University's School of International Service. On his Facebook page, Chodakiewicz says he is a fan of Ron Paul — the libertarian Republican congressman from Texas for whom he voted for president in 2008 — and the late shah of Iran. He admires the Digital Network Army, an anti-gay marriage "traditional values" group. But it is his views on Jews and anti-Semitism that critics say make him a baffling choice for the Holocaust Musuem board. Many of Chodakiewicz's controversial writings about Jews predate his appointment to the museum board. In a 2003 book, After the Holocaust: Polish Jewish Relations in the Wake of World War II, he argued that postwar violence directed at Jews in Poland was seldom due to anti-Semitism. Instead, he cited other factors: Poles' resistance to Jewish communists; self-defense against Jews who wanted to murder Poles who had collaborated with the Nazis; and thwarting efforts by Jews to reclaim property seized by the Nazis and later taken by Poles. Chodakiewicz also maintained in the book that 400 to 700 Jews were murdered in Poland after the war; other estimates place the toll at 1,500 or higher. And he argued that Jewish communists killed more Poles after the war than vice versa. In an article about Chodakiewicz's book for a newspaper in Israel, Laurence Weinbaum, a historian, one-time Fulbright scholar and executive director of the Jerusalem-based World Jewish Congress Research Institute and the Israel Council of Foreign Relations, wrote that Chodakiewicz and "like-minded historians … are hard at work explaining why the murdered — not the murderers — are guilty." Chodakiewicz, Weinbaum added, is a historian with "twisted views." Chodakiewicz also wrote a later book challenging the conclusions of Gross, the Princeton professor, in Gross' book, Neighbors: The Destruction of the Jewish Community in Jedwabne, Poland, that was published in English and Polish in 2001. Neighbors reconstructed the 1941 slaughter of nearly all the estimated 1,600 Jewish residents of the Polish town of Jedwabne in a single day. His depiction of the Jews being murdered by their Christian Polish neighbors, and not the German occupiers, as previously assumed, stirred much soul-searching among Poles who had thought of themselves as World War II victims, not perpetrators. "When the book appeared, it was like an electric shock," recalls Wróbel, the Toronto professor. Chodakiewicz insisted in his own book, The Massacre in Jedwabne, July 10, 1941: Before, During, After, that Gross' methodology, sources and conclusions were suspect, and that the slaughter in Jedwabne was initiated by the Germans. But Gross' conclusions were largely corroborated by a historical commission and ultimately endorsed by the Polish government. And in the United States, Neighbors was a finalist for a prestigious National Book Award. Still, to Chodakiewicz, it was "propaganda." "I live in the American Empire that imposes [on] the world its culture and lifestyle," he said in a 2001 interview with a newspaper published by Radio Maryja, a popular, staunchly Catholic, Polish radio station that is widely regarded as being anti-Semitic, in response to a question about Gross' book. "That's why I knew beforehand how these matters will develop in Poland and which arguments you'd need to use and what you need to look into in your historical research. My friends in Poland have neglected my opinion. Now they can see that I was right." In the same interview, Chodakiewicz said that Polish-Jewish clashes were a result of petty and ideological disputes. He described Jews as murderous in those conflicts, saying that Soviet and Jewish partisans shot 128 Poles in a town in 1943 and killed as many as 300 others the following year in another region. "And the Jewish memoirists even brag about these crimes as commendable actions," he added. "The Polish side needs to accept that not everything on our side was nice, and the Jewish side needs to take a similar stand." Chodakiewicz is a frequent contributor to several Polish publications, such as the weekly Najwyzszy Czas! (The Time is Now!). That's the magazine of the Real Politics Union party, a fringe, pro-life, anti-gay marriage, pro-property rights, anti-income tax group. It often uses anti-Semitic stereotypes on its pages, according to a Tel Aviv University global "Anti-Semitism Survey." It was in this magazine, in November 2007, that he wrote critically about gays. "If everything is equal, if there is no difference, for example, between Christianity and cannibalism, then — according to the argument of those who have an interest in it — homosexuals should be treated as a norm, so they should have equal rights. In reality it is not about equal rights, but about special privileges. The biological norm is about prolonging the species. A deviation from the norm can not be a norm." Indeed, he said, the gay-rights movement threatens society. "The progress never stops, unless it is smashed by the hammer of counterrevolution." He elaborated on those views to the Intelligence Report. "If you are homosexual, that's your business," he says. "However, I oppose any ideology — whether gay or straight — that denies the existence or necessity of sexual mores and that seeks to revolutionize our traditional society by imposing its paradigm on us. Hence, a cultural counterrevolution is needed to check this destructive project." Between 5,000 and 15,000 gay men and lesbians were interned in Nazi concentration camps, according to the Holocaust Museum on whose board Chodakiewicz sits. In 2003, Chodakiewicz was awarded Poland's Jozef Mackiewicz Literary Prize, named for an anti-communist writer who was accused of collaborating with the Nazi-controlled media during World War II. The prize was for a two-volume work that argued that the October 1944 killing of Jews by Polish anti-Soviet partisans in the town of Ejszyszki was accidental. The secretary to the committee that awards the literary prizes is Stanislaw Michalkiewicz. He caused a stir in 2006 when, speaking on Radio Maryja, he claimed that "Jews are trying to force a ransom from our government which they covertly call restitution." He added that Poland was being "humiliated" by Jews at the site of the former death camp at Auschwitz. He was quoted a month later in a Polish newspaper as having said that the World Jewish Congress is "a main firm in the Holocaust Industry." 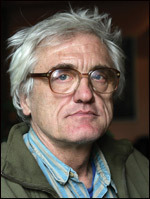 One member of the jury that awards the prizes resigned in 2006 over what he said was Michalkiewicz's anti-Semitism. Mackiewicz, who died in 1985, often declared that no subject should be off limits, including "uncomfortable truths." Chodakiewicz sees himself in the same mold. He told an interviewer in 2007 that his interests "are in topics which scholars generally avoid because of the terror of political correctness." That seemed particularly obvious in July 2008, when he wrote in Najwyzszy Czas! about then-presidential candidate Barack Obama, who he claimed was at one time a Muslim, a radical, and a friend and protégé of communists whose mother was a "feminist, social-liberal, hippie and a fan of F.D. Roosevelt." Chodakiewicz's assertions about Obama, however, aren't what concern critics of his appointment to the museum. His membership on the board insulates him from accusations of insensitivity or bias toward Jews, they say. "He uses this as a very strong argument," Wróbel says. Chodakiewicz's inclusion on the museum's board is "bizarre," Weinbaum adds, "because his views seem to be in stark contrast with the mission of the museum — at least as I understand it." Wróbel agrees. "I couldn't understand it. I don't understand it." Chodakiewicz's critics contend that he seems far more concerned about the "Christian predicament" than the plight of Jews, who were targeted for complete annihilation. In a 2007 interview with the Journal of Polish American Affairs, Chodakiewicz had this take on his experience serving on the Holocaust Museum board: "It teaches one that an ethnic group of American citizens can organize itself to prevail on the Congress and the federal government to fund and propagate the teaching of the greatest tragedy that befell upon this particular ethno-religious minority thousands of miles away from the United States." Then he suggested that perhaps Polish Americans could also "organize themselves to such a commendable end." Rafal Pankowski, an official of the Polish anti-racist organization Never Again and the author of a book on the Polish radical right to be published by Routledge next year, contributed research for this article.